What sells a book best: the words on the page? Or the marketing? Brigantine Media, a small publisher based in St. Johnsbury, is betting on both. On Monday, the company announced its new Publish or Perish Writing Contest. The prize? A publishing contract with a $2,000 advance on royalties. The requirements for entry? A manuscript and a marketing plan. The contest's "twist" is that both are weighed equally. Acquisitions editor Neil Raphel says to "Think 'American Idol' crossed with 'Shark Tank.'" Every writer who's ever looked at Google ads knows that "writing contests" are as common as dodgy publishers eager to put out your book. Both tend to have one thing in common: They want your money. By contrast, Publish or Perish isn't asking for an entry fee — a "positive sign" that, together with its "interesting angle" toward marketing, helped get it recent coverage from Jennifer Mattern on the All Indie Writers blog. Cover of a book in Brigantine Media's Rules! series, illustrated by DreamWorks animator Steve Hickner. Brigantine Media is an imprint of Raphel Marketing that has carved out a niche as a small publisher of business and education titles. In recent years, it has also published fiction, including titles by Vermont authors Beth Kanell, F.D. Reeve and Jenny Land. (In conjunction with Land's middle-grade novel The Spare Room, the publisher ran a kids' writing contest.) Read more in Cathy Resmer's write-up of Brigantine from 2011. Janis Raye, Brigantine's editorial chief, says the publisher has put out 10 to 15 books annually over the past two years. As for the contest, "This is not a gimmick," she says in a phone interview. "We’re serious publishers." Why the contest's dual focus on content and marketing? Says Raye: "Our experience has been, the author’s ability to market the book is generally what drives the book’s success. Let’s celebrate authors who are able to do this. "We talk to a lot of authors, and their ideas of what will help sell their book are, sadly, often unrealistic," she goes on. Some writers, for instance, think it's enough to "know" a lot of potential readers. In fact, Raye says, successful book promotion is about identifying and reaching a specific audience. She cites the example of Laura Candler, a retired teacher who's had "great success" with her educational guides published by Brigantine, amassing Facebook likes and teacher testimonials. "She’s done it primarily through social media presence," Raye says of Candler, who "spends 12 hours a day marketing her books. She expanded heavily into Pinterest, because that’s where teachers are." That kind of gregarious approach may work for an educational or business expert — many of whom sell their books at speaking engagements — but what about the stereotypically reclusive fiction writer? Raye acknowledges that "We find fiction hard to sell. Most fiction authors have not really found their audience." But the contest, she says, is open to writers in all genres, including ones Brigantine doesn't normally publish. Raye and Raphel plan to read every entry, and they hope to be "overwhelmed" by the response, Raye says. "We’re looking for good books!" 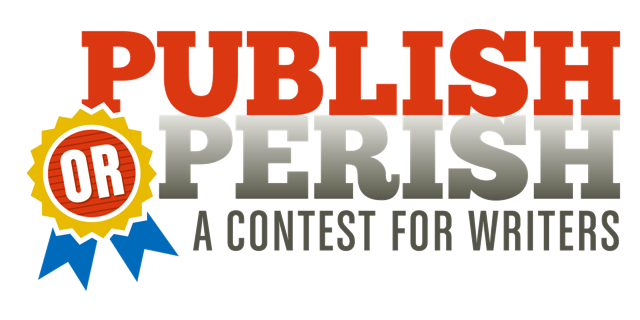 Entries for Publish or Perish will be accepted until August 15, 2015, with the winner announced on September 15. Go here for rules and a FAQ. And check out a sample contract from Brigantine Media here (PDF). Raye says Brigantine does print on demand and offset printing as well as e-books, depending on the title and likely demand. It distributes directly to Vermont and New Hampshire bookstores as well as through the usual national outlets. As always, take a look at the nitty-gritty of the contract, spend time at Writer Beware or a similar site, and educate yourself about publishing lingo before you sign anything. Just like having a marketing plan, getting the facts is vital to looking out for your interests as an author.